The Integrative Ecology Lab of Jocelyn Behm and Matt Helmus from the Center for Biodiversity at Temple University is looking for a field assistant to help out with herpetological field surveys aimed at studying how human development influences exotic and native species on Curacao from mid-January to mid-March 2017 (start date somewhat flexible). Previous field experience with herps, insects, birds, and/or in the tropics preferred. Field work will entail surveying and capturing herpetofaunal species (lizards, frogs) and their prey (invertebrates and plants), and visual surveys for avian predators. 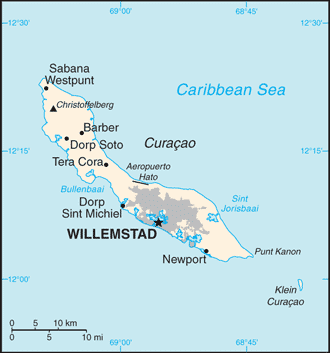 Curacao is a small island in the southern Caribbean situated between Aruba and Bonaire just north of Venezuela. -Ability to perform day and nighttime surveys in hot, mosquito-y, conditions. -Must be comfortable handling lizards, frogs, insects, and their excrement. -Willing and able to learn new field techniques as needed. -Attention to detail, organized, and able to accurately follow instructions. -Must be clean, courteous, and able to get along with others in a team setting and shared housing situation. We will provide lodging and cover roundtrip travel costs from the US to Curacao, and a stipend is available to cover food costs while in Curacao. Review of applications will begin December 17 and continue until the position is filled. Hi, My name is David Olaya I’m a graduated ecologist from javeriana University in Bogotá Colombia. I have experience with frogs, snakes and lizards, that’s why am interested in the herpetology volunteer. I will appreciate if you can send me more information about the program and where i can send the requirements. Hi, I am Gloria Gómez-Lobo Moya. I'm graduated Environmental Sciences from the "Uneversidad Autónoma de Madrid", Madrid (Spain). I do my final degree project about HSP90 (heat shock protein 90) in Podarcis muralis. I do my external practices colaborating with "Museo Nacional de Ciencias Naturales" (MNCN, National Museum of Natural Sciencies) in a project with lizards around Iberian Peninsula. I help in a project with amphibians in Natural Park Sierra de Guadarrama. I am really interested in continous my learning about herpetology and conservationism and I think this volunteer is perfect for that. I participate in a volunteer before and I like a lot the experience. I wonder how can I point me to this volunteer. Review of applications will begin December 17 and continue until the position is filled. "